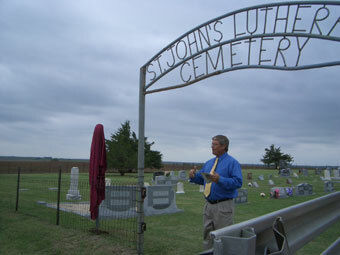 A dedication ceremony to commemorate the historic designation of the St. John's Lutheran Cemetery was held on Sunday, September 3, 2006. 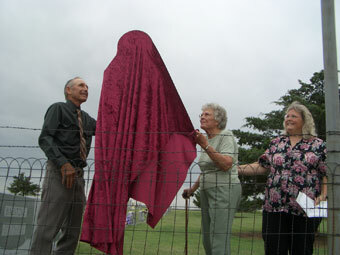 The Sunday afternoon unveiling of the Texas Historical Commission Cemetery medallion was held at the entrance to the cemetery. Kellie Koch Kjos hosted the event. Ms. Kjos is the great granddaughter of Jacob and Amalia Koch who donated the land for the cemetery. Ron Schneider provided the invocation with Scotty Schilling, County Commissioner, spoke of the history of the cemetery and related a historical perspective on how cemetery's originated and funeral rituals began. Ervin Koch and Linda Weiderstein unveiled the historical marker. Mr. Koch is the grandson of Jacob and Amalia and Ms. Weiderstein is the youngest daughter of the Kochs. Dorothy Schoenhals read the historical description to the group of over 60 who attended the afternoon event. The St. John's Cemetery was started in 1916 when Jacob and Amalia Koch allowed church members to bury family members on their land. The land was finally deeded to the church in 1950. The first burial was baby Hildegard Schilling, January 11, 1916. Three other Schilling children were buried in the next six years. There are fifteen children's burials in the cemetery during the 1920's and the depression years of the 1930's. These deaths reflect the hard times suffered by the early Lipscomb settlers. Fiels, Herbers, Kappel, Koch, Meller, Stable, Babitzke are some of the many German Russian names marked on the tombstones. Victor Born, a charter member of the Church, made the welded iron name of the cemetery in approximately 1949. There are 94 graves in the beautiful rural cemetery and each grave has a permanent marker. The Lipscomb County Historical Commission volunteers, Dorothy Schoenhals and LaVaun Kraft contact family members and other parties to solicit funds to ensure that all unmarked graves receive a marker. Contact the museum or these ladies if you are interested in the cemetery project. The designation of a Historic Texas cemetery is reserved for cemeteries that are at least 50 years old and are deemed worthy of recognition for its historical association. St. John's is the fourth Lipscomb County Cemetery to have its marker dedicated. 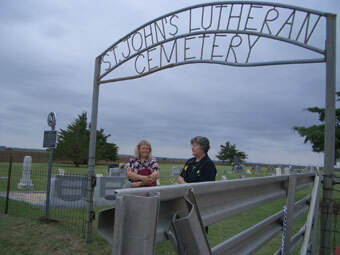 Six cemeteries have received historic designation with Viewpoint and Heart to receive markers in 2007. The last three cemeteries will be finished in 2007-2008. The event was part of a Koch family reunion held in Lipscomb. County Commissioner, Scotty Schilling, relates the history of the cemetery. Ervin Koch and Linda Weiderstein unveil the Historical Marker with Kellie Kjos looking on. Kellie Kjos introduces Dorothy Schoenhals, County Cemetery Project chairperson.